Dianese offers the Raptors Shoes in two versions at present (a WP version will come out later). There is the standard shoe and also the “Air Shoe”. This product page shows the standard version so take the link at the bottom of this page to see the “Air” version. This is a sleek sport shoe which looks fast just sitting here on the desk!. 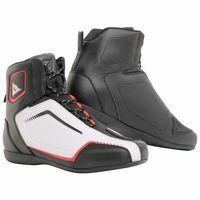 The styling of the Raptors shoe is made to look very much like a race boot. The sole and toe box areas are low profile to fit under sport bike shifters. The top of the foot has the shifter pad and on the outside of the toe area is an extra bit of material to improve the abrasion resistance in that area. It is made to mimic the look of a race boot toe slider. I like how the laces are built… the eyelets work with the laces so you only have to tug on the lace ends to tighten up the whole foot… kind of like speed laces on a work boot. And across the tongue of the shoe is an elastic strap with a little pull tab. You can easily tuck the loose ends of the laces underneath to keep them out of the machinery. What a simple solution! There are built in protectors on each side of the ankles to add some impact protection. The heel cup is also reinforced. The plastic material around the back of the foot and heel is some sort of etched finish which is sharp. The “Air” version of the boot has panels of micro perforated material which will allow good air flow for hot summer riding. If you look at our closeup pictures of both boots you can see the difference the standard boot and the “Air” boot. Both version have the same MSRP so pick the one to suit your climate. Otherwise the versions are the same.